I have been in the workforce now for the past 30 years. I have been running in circles, twisting, turning corners – running into walls turning around and starting again. The cheese has been hidden, taken away, moved and replaced countless times. 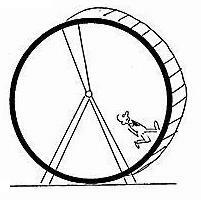 I found myself stuck on a spinning wheel for days – desperately running and running trying to make some progress to no avail. Collapsing onto the bottom of the cage still locked in behind the bars – a vial of water and some crumbs of cheese spread across the floor. My heart was broken and my spirit had run dry – lips were chapped and cracked and my legs I cannot feel or move. My own inclination had to be ignored and my thought process was paralyzed and scrubbed away by the powers. I was born to run – but taught to crawl. I chose to stand tall – but forced to kneel. I wanted to laughed – but was told to be serious. Run, stop, pay, get out of jail cards are for losers and there are not hotels where you will be accepted. “Who wants to be accepted?” I asked. Society hammers you down – you start out as an individual but end up grazing in the fields. Society keeps on banging – change, change, change. The sun rises in the morning, the door to the cage opens – running onto that wheel again until the sun sets and I end up on the floor with some water and crumbs of old cheese. There is no view from here – no rays of sun other than the spiral of light which enters from that hole in the blackened window. There are voices all in unison – no one sings solo’s, no one breaks into their own dance or jumps and smiles in freedom. Freedom is just a lie to get us here – the cage is the life we will live until the end of the night. Until the end of the night where there are no wheels, no judgments and no expectations to be as others conceive us to be. Where love is more than just a four letter word and the currency is air and independence. Until the end…when conformity will be a sin and cages non-existent. I couldn’t agree. Thank you for putting it so well. Cool post. Have you heard of the smashing pumpkins song bullet with butterfly wings. It would go well here. Going to listen to it. Thank you! Having been in the workforce for a long long time, I think I understand and empathise. Having said that, it is really a matter of choices. Employment has its drawbacks, but also advantages.